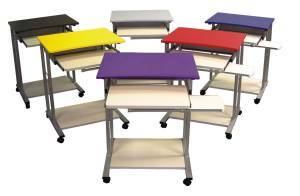 A fresh and efficient alternative in compact computer carts, in 5 different colors, to spice up your working environment. Add a computer workstation in virtualy any corner with the LCT29 narrow 24" computer desk. - Dimensions: 29"H x 24"W x19"D.
Computer workstation made with wood and steel. Five, fun colors to choose from to energize your environment with color. Complete with 2" furniture caster, two with locking brake. Comes with pull-out keyboard shelf, and a pull-out mouse shelf.